Do I have too much stuff? One thing I found after watching documentaries and reading all the downsizing books, I started to feel like I had way too much stuff. Despite having downsized our home and all of our belongings, I still felt like I was never doing enough. Am I the only person this crazy? Everyone who wrote books and starred in documentaries had done major downsizes. They were living in tiny homes, living out of backpacks and absolutely loving their life. 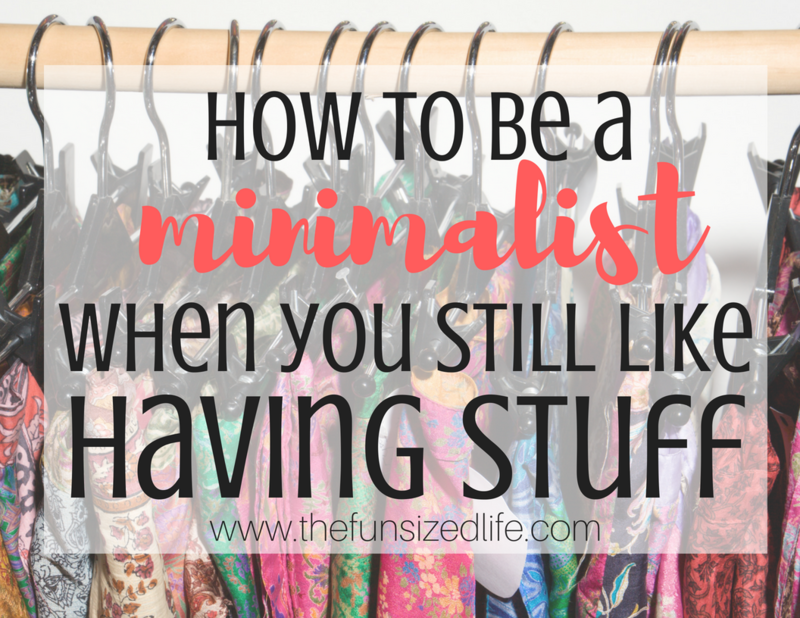 I couldn’t call myself a minimalist and still have a house full of things. My clothes would never all fit in a backpack. Clearly, these people were just way better than me. Right? Slowly I started to realize, there weren’t actually rules to minimalism. So why did I feel like creating them? There would never be a point in downsizing or minimizing where I would know I had officially “made it.” Minimalism is meant to be a way of life. Living with more purpose and intention. It’s okay to own things. Some items will enhance joy. Stuff isn’t bad — the love of stuff is bad. Even while reminding myself of all of this, I couldn’t help but think maybe there were guidelines that would help me keep myself on track. I didn’t want to fall back into the giant consumer, credit card debt pit I had been stuck in before. So I decided to get intentional. The golden rule: out before in. Toys – Like I said, if Christmas or a birthday party are coming up, clear out the old toys before the new ones make their way in. Did you know places like Decluttr will even pay you for old toys, like Legos? Clothes – If I know I need to update my wardrobe, or if I get some clothes from friends, before I hang anything else up, I clear out some of the old, less worn things. Food – Yes, food! Before we go grocery shopping we make sure to go through our fridge and clear away or finish up any leftovers that we have. I also try to keep in mind ingredients we have left in the pantry, I come up with meal ideas based off those items so I don’t end up purchasing too much at the store. If you aren’t great at meal planning, try out the $5 Meal Plan and have someone else do the dirty work for you! –I also make sure to shop with my savings apps to get the most money back as possible. Paperwork – This is probably one of the things that drives me the craziest! I hate when paperwork clutters the counter tops! As soon as we bring in the mail, I am quick to sort the “junk” mail right into the recycling. You can also cut them off at the source by removing yourself from their mailing list. Let’s face it, the world is going digital anyway! There is a great eBook and course called The Paperless Home that gives you all the information you need to totally transform the way you file and store your important papers! Check it out! I make sure to clear things out before anything new makes it in and I also make sure what comes in is only the top quality of items. When I’m shopping, if I don’t absolutely love the shirt I try on, I won’t get it. It doesn’t matter if it’s on sale or not. I would rather buy a $60 dress that I LOVE and will wear constantly than a dress that’s $5 that I have luke warm feelings for. Is there something else I could use? –If I wanted a dress for an upcoming wedding, I might consider my current dresses, or consider borrowing from a friend. If you decide the minimalist way of life is for you, and you love the idea of a tiny house, it doesn’t mean you have to go from a 5,000 square foot home into a 900 square foot trailer to be successful at it. We downsized our house over a year ago and have repeatedly had to re-downsize. Then, like I said, with my wardrobe, I up-sized again. Well, I didn’t really up-size, I just didn’t force myself to downsize where I wasn’t ready to. Who knows, maybe someday I will end up living in a portable tiny home. –Please God let it be after the kids move out, because heaven knows Mama can’t take that kind of smothering. I do know it doesn’t have to be today or even in the next 10 years. What I do know is that minimalism has cleared my mind and my house. I wake up happier and for today, it works for me where I’m at. So give yourself patience and grace and know that this doesn’t have to be one drastic life change. If you find yourself stressed or feeling unsuccessful (as I did) then you’re doing it all wrong. Minimalism should be a peaceful, enjoyable experience so make sure to keep your peace. Keep the things around you that make you happy. Hang the art that brings you the most joy. Wear the clothes that make you feel awesome each day. Collect what you want and let go of what doesn’t enhance your life. Minimalism is just choosing to surround yourself with all the right things and letting go of any minor distractions.